Today’s post is sponsored by the U.S. Potato Board. All opinions are our own. Have you ever had a croquette? 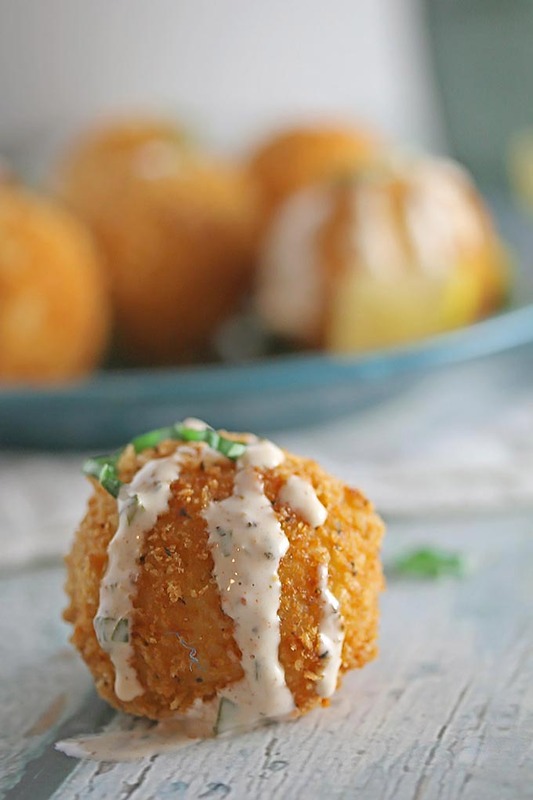 If not, make these Cajun Crab Croquettes immediately! 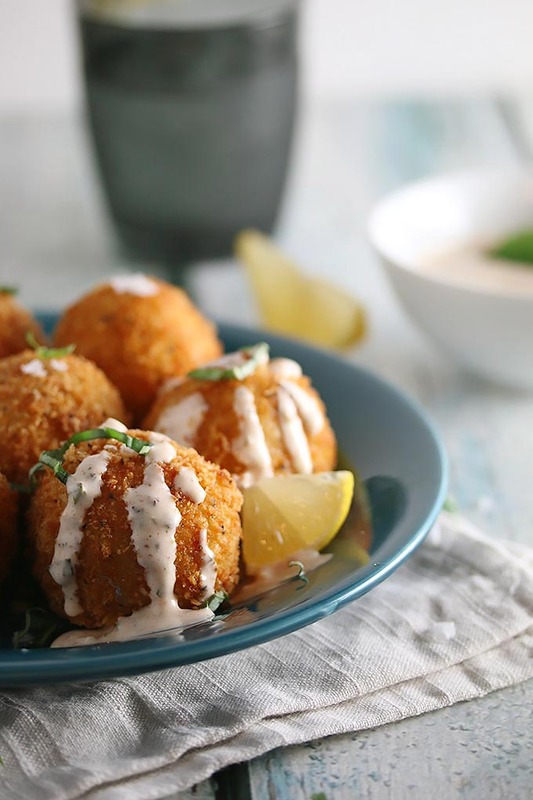 Tender balls of creamy mashed potatoes stuffed with cajun seasoned crab, sweet corn, smoky bacon, and sharp gruyere cheese that are deep fried to golden perfection and then drizzled or dipped in a creamy cajun lemon sauce with fragrant fresh basil. 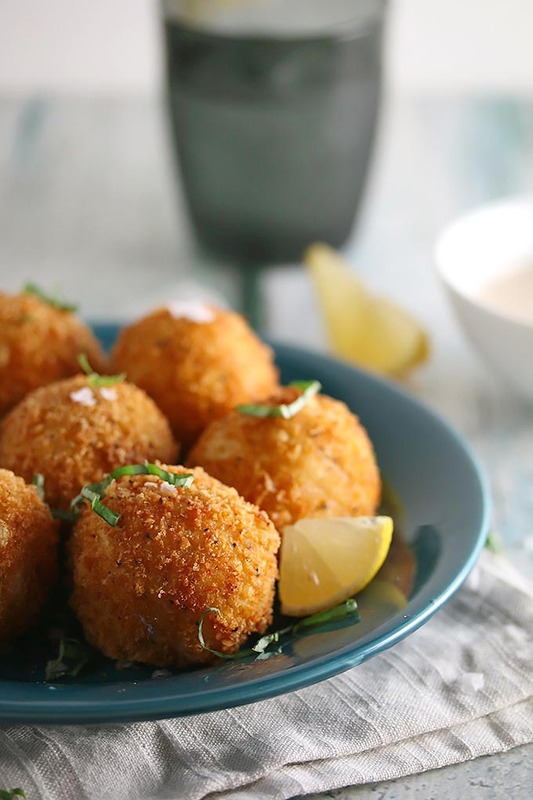 Croquettes are little balls of mashed potatoes that are sometimes stuffed (like ours are) and then rolled in a crust of some sort and deep fried until golden brown. They were originally a French delicacy (the French sure know where it’s at! ), but now pretty much every culture or cuisine has their own version. 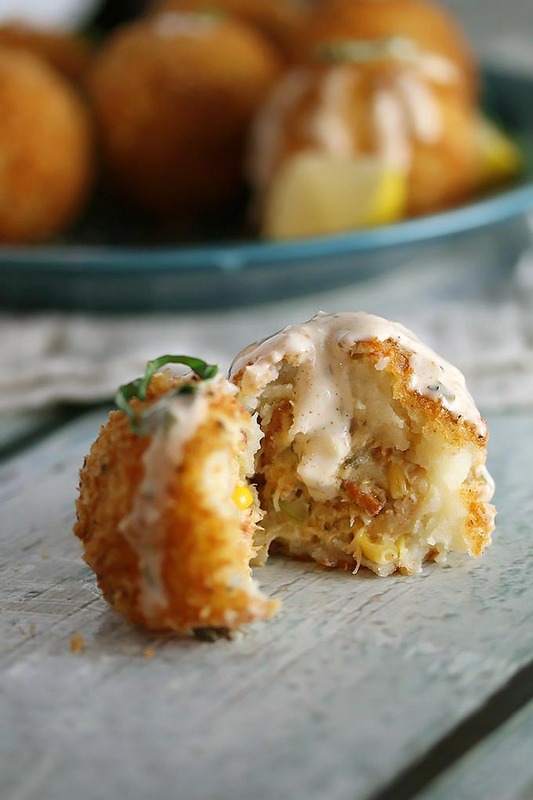 These crab croquettes are our take on a New Orleans version, stuffed with crab and cheese. 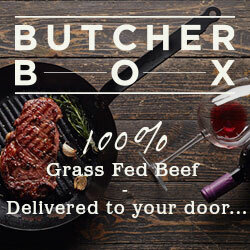 Just in time for your Mardi Gras party! I suppose to be seriously authentic then these should be crawfish croquettes. But we can get crawfish in our neck of the woods. Not easily anyways. Apparently croquettes are quite the thing in New Orleans, with travel websites listing the best places to eat them here like this one and this one when visiting. There is even a restaurant called Croquette in New Orleans! We would sure like to try them all. Every. Last. One. If you are going to Mardi Gras this year, make it happen for us. OK? The star of these crab croquettes is most definitely the potatoes. Potatoes are a seriously versatile vegetable! You can fry them, boil them, roast them, mash them, bake them. And they taste great in any and every form! The US Potato Board website www.potatogoodness.com has tons of delicious recipes using these root veggies. Check out this video recipe for Bombay Spiced Potatoes. Don’t they look delish too? Potatoes are loaded with goodness. Vitamins B and C, antioxidants, potassium, magnesium, fiber and naturally gluten free! 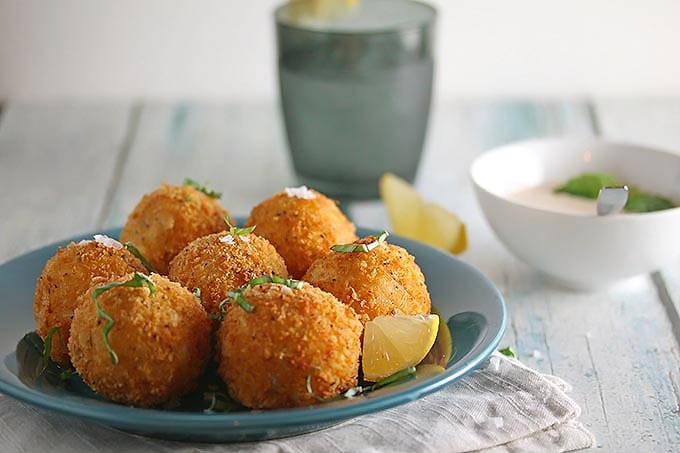 It would be a bit of a stretch to say that these cajun crab croquettes are healthy, but man are they good! Packed with flavor! And have I mentioned addicting? Debbie and I stuffed our face with this whole plate after we took these photographs. And they were worth ever single extra min I had to work out the next morning to make up for it. First make the mashed potatoes. Peel the potatoes and cut into chunks. Add them to a large pot, cover with water and bring them to a boil. Cook until you can slide a fork into a potato easily. Drain and either rice your potatoes back into the pot or add them back in and mash them well with a masher. Add the butter, cream and salt and mix well. Set aide to cool. Next make the filling. Add all the filling ingredients to a medium bowl and stir to combine. Set aside. Make the sauce. Add all the ingredients into a small bowl, stir well and set aside. Make the balls. First take a tablespoon of the filling and roll it into a ball. Next take 1/8 of a cup of mashed potatoes and roll into a ball as well. Using your thumb, make a hole in the mashed potato ball and slide the filling ball into the hole. Push the mashed potato around the filling ball until its completely covered. If any spots of filling are showing, just take a little potato and patch the hole. Roll the ball around again so its got a nice circular shape. Repeat with the rest of the potato and filling. 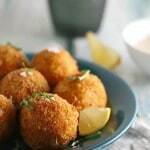 Pour vegetable oil into a medium skillet to measure 4 inches deep (you want it to just cover the croquettes) and heat over medium-high until a pinch of breadcrumbs bubbles immediately when added. Dip potato balls in the flour, then the egg, and then roll in breadcrumbs. Working in batches, fry the croquettes, turning often, until golden brown and crisp, 3–4 minutes. Remove from the hot oil with a slotted spoon. Drain on paper towels. Serve right away with the sauce! Holy moly! I just don’t eat enough crab and I’m always looking for new crab recipes. These look amazing! We love crab cakes and these take that idea to a whole new level. WOW! Pinning! Thanks Erin! I hardly eat crab either but when I do, its like this. Or crab cakes. Thats it lol. A can of crab? What size can? Sorry we forgot that bit! Its a small 250g can. Ive updated the recipe. Thanks! Can we make this recipe ahead of time and freeze till we’re ready to fry it? If so, what step could we start to freeze it at? YUM!! These all look like the perfect Cajun Crab Croquettes to me! I’d love to get them all a try! Thanks 🙂 They are delicious!